There are so many things Russian loves to do in spring time. If you get a chance to go to Russia during March until April, you may find that Russia is in spring time. Although the weather is still cold, at least there is not much snow falling. Moreover, you can see the first sunlight after a long winter and see the ice melt. However, you probably don’t want to go there in the first spring. Because it is still so cold with the temperature being below 7 degree celcius. While spring in Russia begins in the first March and ends in the end of May, it is different in Saint Petersburg. Spring begins in the middle of April in the city, instead. Although there is difference in term of time, the chill is the same. However, Russian people does not bother with the temperature. They embrace it as any other weather they embrace. They also do several activities they love to do in springs. What are they? Here are 6 things Russian loves to do in spring time. Muscovites love to have spring celebration in the form of Easter festival. This is a music festival of the Orthodox Church’s most important holiday. At that time, they enjoy the bell concert. It is when cathedral bells are struck to produce melodies. Then, the early spring air carry the melodies throughout the city. Besides the Easter festival, Moscow has another festival called Maslenitsa, which means “Butter Week.” Muscovites use the time to fill up their energy after a long, cold winter. During the festival, there are a lot of foods, drinks and games. They also do some Russian traditions. At that time, they will stack their plates with many foods and anything to fill their stomach, especially Russian pancakes. Because at that time, there is a tradition that Russian mothers make a lot of pancake for the festival. Moreover, that is the time with girls and mothers color their chicks red in round shape. The festival took a week, starting from May 17. You will not see any place without food. In addition to Russian pancakes, there are raisin cakes, Kulich, Pashka, cottage cheese cakes, and painted hard-boiled cakes are everywhere. There are a lot of celebrations in May. There is Labor Day in the first May and Victory Day in May 9. During that times, there are many parades. They enjoy looking at parades with many people wearing colorful clothes. Moreover, there are usually fireworks and a lot of excitement in the street. Those are fun times to go outside the house. Because there are many veterans of World War II going out wearing their uniforms and proudly showing off their medals of honor. Meanwhile, other people give them flowers and listen to their stories. During the Labor Day, many Russian people spend time by relaxing and enjoying their “me time.” Because at that day, they have a holiday. For some of those who have dachas, however, they will retreat to their country homes called “dachas.” They usually work in the garden to plant some vegetables and fruits or spend time with their families. Some men also give their women flowers, especially tulips and lilacs, as the flowers bloom in spring. Meanwhile, parents often give ice creams or balloon to their children. They usually do it in the end of cold season. Those gifts are not without underlying meaning. Tulips and lilacs are the symbol of late spring. Meanwhile, balloons are symbol of celebration. As we know that there are many museums in Russia, Peterburgers use the moment during spring to visit some museums. Russian people are famous with their love of historical places and stories, especially Peterburgers. They even love to visit museums more than Muscovites do. People in Saint Petersburg will visit some museums in the end of May to take part in the event. During the event, museums management open the door in the evening and at night for visitors. They have such special programs as plays, concert, master classes, even historical reconstruction, including daily exhibition. Although the event is special, the museum are usually quite empty in spring. It is really different from that in summer. So, you don’t need to worry about taking part in the event as there will be no crowd. 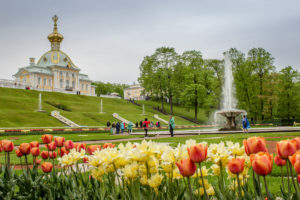 Like any other spring in other countries, Russian also have “Spring Cleaning” although the call it “general cleaning.” At that time, they will clean everything at home, like washing curtains, windows, lamps, crystal ware and other things. Cleaning windows is easy in Russia because their windows opens inside. There are some windows that can be unscrewed to make cleaning easier. However, they can choose to call cleaner professionals to do some hard works, instead. General cleaning also means moving furniture and carpet. They move furniture so they can clean some places that are seldom to be cleaned. They also use a tool to beat dust out of carpet. Those are 6 things Russian loves to do in spring time.